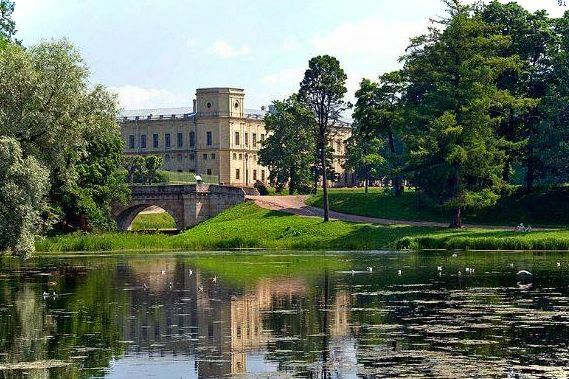 Gatchina Park is a pleasant place for walks, where the air is clean and transparent, where you can admire the beautiful scenery, as well as touch the history of Russia and see interesting garden and park buildings. Unlike other parks - Pavlovsk and Ekaterininsky in Tsarskoye Selo, the entrance to Gatchina Park is free, so this is a favorite place for walking the residents of the Leningrad region and St. Petersburg. The most convenient way to get to Gatchina is by train reaching the station Gatchina Baltiyskaya. From the railway station there is a wide street to the Palace, behind which is an English garden decorated in the landscape style. This is the largest part of the Palace Park, in which the White and Silver Lakes are located, as well as most of the park facilities. Unlike a regular garden, there are no smooth lawns and straight alleys, the nature pleases here - forest and lawns, winding paths leading to beautiful pavilions, as well as rivers, lakes and ponds with openwork bridges. Everyone can admire the scenic landscapes from the water, renting a boat. Underground passage leading from the Clock Tower of the palace to the Silver Lake and the grotto called "Echo". If you walk along the underground passage, the echo repeats the spoken word four times, so the grotto was called Echo. Chesme obelisk in honor of the victory of the Russian fleet over the Turkish in the Battle of Chesma in June 1770. Led by Alexei Orlov, brother of Grigory Orlov, one of the biggest battles of the Russian sailing fleet was won. Interesting buildings are located next to the Birch Gates - it is the portal "Mask" and the original Birch House hidden behind it. The pearl of the Isle of Love is a pavilion dedicated to the goddess of love Venus. A small part of the Palace Park is made up in a regular style: the Linden Garden adjacent to the Palace, the Upper and Lower Dutch gardens, as well as its own garden, restored several years ago (entrance is free of charge). The distinctive peculiarities of these gardens are clear lines of avenues, well-groomed lawns, trimmed bushes and smooth rows of trees. Own garden is small in area, there are many sculptures and there are galleries covered with climbing plants (berso). The Lower and Upper Dutch gardens are created on bulk terraces near the palace. The Lower and Upper Botanical Gardens located near the Admiralty and Admiralty Gates also have a regular layout. As the decoration of these gardens are two ponds - Octagon in the Upper Garden and Round - in the Lower Garden. To the north of the Palace Park is the Menagerie. This green zone is more like a forest. To be true, for nature lovers there is an interesting place - Miracle Glade, you can find it if you go along the river Teploy (Gatchinka). Here you can find rare plants listed in the Red Book and snails which are in a size of a fist. However, quite large snails after the rain you can see throughout the park. In 1765 Ekaterina II presented the Gatchina manor to her favorite Grigory Orlov in gratitude for helping in the palace coup in 1762, in the result of which she became empress. It must be reminded that in 1762 a riot was organized, Emperor Peter III was deposed, and a week later, under strange circumstances, he unexpectedly died, according to the official version, from hemorrhoidal colic. The nature of Gatchina has been famous for its beauty for a long time. Picturesque shores of lakes and rivers were located for walks in the best way, and the forests around them became a great place to hunt. In his letter to Jean Jacques Rousseau, Grigory Orlov wrote that the air here is healthy, and the water is amazing, the terrain is pleasant for walks and excites to dreaminess. The count was a passionate lover of hunting games and social entertainments, so he turned a large territory near the house into the Menagerie - Hunting Reserve, where paddocks were built, in which wild goats, deers were brought in, as well as inhabitants of local forests - elks and hares. In 1766, under the leadership of the famous architect Antonio Rinaldi, the construction of the palace begins, and around it a park is fixed up in a fashionable at the time landscape (English) style.Since 1771 the works on its arrangement was headed by the English master of garden art John Bush, also he is assisted by gardeners invited from Petersburg, and thousands of peasants from the surrounding villages. The basis of the transformations two lakes were served - White and Silver, where works were carried out to deepen the bottom, channels and dams had been built, islands and islets had been created. To Gatchina thousands of trees of various breeds from the vicinity of Moscow and Nizhny Novgorod had been brought. Wildlife is transformed into a beautiful landscape park with picturesque lakes and ponds. After the death of Count Orlov in 1783, Catherine II bought the estate from the Count's relatives and gave it to her son Pavel Petrovich. The main buildings and the decoration of the park during the reign of Paul I took place in the 90s of the XVIII century under the guidance of the architect Vincenzo Brenna. Together with him a talented garden master James Geket has worked, he formalized the palace part in the regular style and completed the layout of the Sylvia area. At the same time, artificial ponds of unusual shape were created - Karpin and Rectangular, Octagonal and Round, Oval and others. After the death of Paul I in 1801, works on the development of the park were not so intensive; mainly they were aimed at maintaining the existing buildings in good condition. In 1917 Gatchina Park became the property of the people and was opened to the public. At the beginning of the Great Patriotic War, part of the values ​​were evacuated, many of them were hidden in the ground. When Gatchina was occupied by German invaders, trees were destroyed in the park, bridges were exploded, and most of the structures were damaged. The restoration of the palace and park complex began immediately after the liberation of the city. Gatchina Park is beautiful at any time of year, but the most picturesque landscapes can be seen in the golden autumn. At the same time, due to a lack of financing, many green areas and park facilities remain in a state of neglect.In 2014, a large-scale restoration of the park zone began, it was planned that until the 250th anniversary of the founding of the palace (in 2016) we will be able to see a part of it in the form as it was at the end 18th century.